Waiting for the rain to end. Hoping the rain will subside yet still busy observing an open field looking for a morsel on a rainy day. 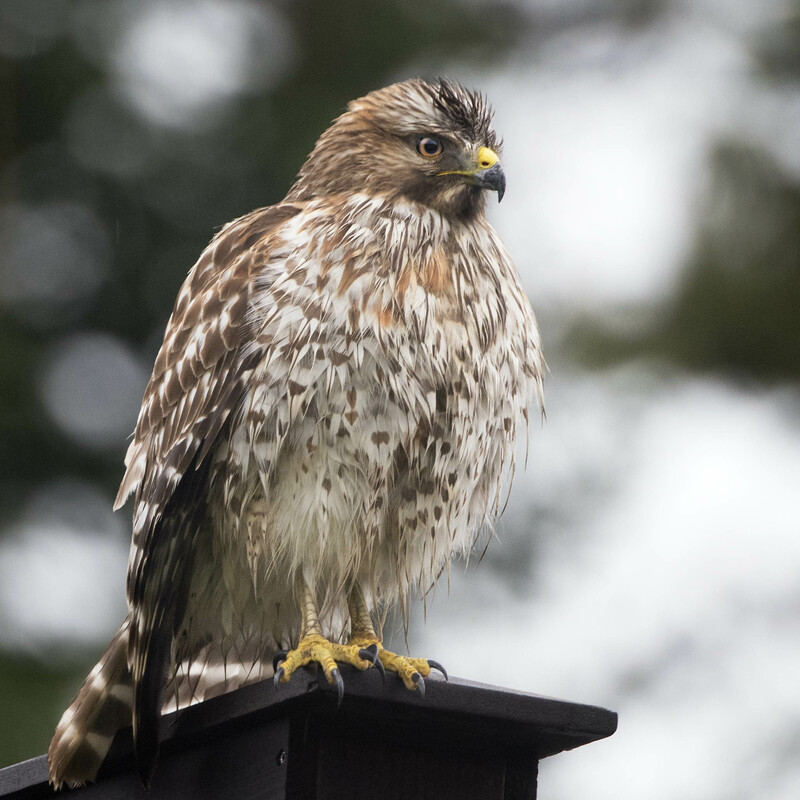 A beautiful hawk waiting for the rain to end in Mendocino, CA. Wonderful capture. I love the detail! Thanks Laura, I guess it was the rain but this hawk let us get fairly close. Have a great weekend. You’re welcome. Enjoy your weekend as well Mike! Thanks Alix, a tough bird to spend the day hunting in the pouring rain. Not sure if he got any mice or not. Nice capture. Hawks and eagle always seem to me to have such a serious look about them. Hi David, I guess that is their nature always vigilant and on the lookout for a meal. hope your week is off to a flying start. All puffed up! Such an intense eye gaze and look at those talons. 🙂 Great shot, Mike. Thanks Eliza, this was one intense a not easily distracted hawk and not easily detoured from his task at hand as it was raining hard that day. Thanks and thanks for the feedback as we appreciate you thoughts. Hop your week is off to a great start. Nice photo of a beautiful bird! Great photo! Thanks, this was one intense hawk focused and hunting on such a rainy day. Not sure he got any mice as if I were a mouse I would not leave my burrow in that type of rain. Hope your week is off to a wonderful start. Beautifully and wet on a rainy day! Hi Karen, It was quite a wet day but there perseverance of this nightly hunter was evident. Focused on the open field waiting for mice I believe. Thanks for the feedback and taking time to leave us your thought as we really appreciate them.